Ronny Cox’s Wikipedia entry describes him as an actor, singer-songwriter and storyteller, but as far as he’s concerned, it’s the other way around. “Storyteller” definitely comes first. That becomes evident as soon as he starts reeling off bits of his history, delivering one fascinating anecdote after another about his music career, his myriad stage and screen roles, and even his lengthy marriage to his high-school sweetheart, the only girlfriend he ever had. In concert, using nothing more than the power of his projected words, Ronny captivates listeners with all kinds of stories. Some are spoken; some are sung. But either way, he’s employing that age-old art form to forge connections he says he can’t as an actor. He characterizes that experience as addicting — and undeniable. Ronny starts building intimacy with his audiences the moment they enter each performance space. He actually greets them personally, even if they number in the hundreds, and avoids opening acts — because, he says, “I am the opening act.” Even before he takes the stage, he’s setting the tone, one of warmth and familiarity. “I want it to feel like when we were kids sitting in the living room or the kitchen or on the front porch, sharing stories and songs with our family,” he says. He also discourages big introductions, preferring to disclose the details of his colorful life in his stories. “To me, the story is equally as important as the song,” Ronny says. Raconteur that he is, however, he admits, “If I don’t have a story for a song, I’ll make one up. Let’s back up for a second here, if only to challenge the implication that actors don’t connect with audiences. Obviously, that’s not true, or Ronny would never have been able to turn his guitar-strumming “Dueling Banjos” scene in Deliverance into one of the most iconic moments in cinematic history. He’s made many notable appearances since, including roles in the films Bound for Glory, RoboCop, The Onion Field, Total Recall and Beverly Hills Cop I and II. He played Dr. John Gideon in St. Elsewhere’s final season, and Deacon Claybourne’s father, Gideon, in Nashville’s final season. But Ronny got that first role because he could play, and Bound for Glory as well. 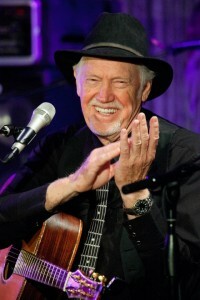 Same with his first TV series, Apple’s Way, and his Nashville run — which also led to the happy circumstance of performing his own song, “I’ll Waltz You Home,” in an episode, then recording it for the final soundtrack compilation. The producer even rounded up the same musicians with whom he originally recorded the song years ago. It also appears on his 2012 album, Ronny, Rad and Karen, recorded with multi-instrumentalist Radoslav Lorković and singer-mandolinist Karen Mal. That affecting version, with Mal wrapping harmonies over his timeless tenor, seems particularly melancholy, as if he’s singing directly to the lost love of his life. By then, Mary was gone nearly six years; she passed away on the 50th anniversary of their first date. That took place in Portales, New Mexico, where her family had moved when she was 11. Ronny was 13 when his family relocated from Cloudcroft, New Mexico, where he was born. They were already a couple when Ronny, still in high school, first stepped inside a recording studio. During a performance in nearby Clovis, a local record producer heard his band — and instantly recruited them to sing behind a new artist from just over the border in Lubbock, Texas. That producer was Norman Petty, who was already working with another Lubbock talent: Buddy Holly. He dived deep, spending a couple of years studying the Child anthology of old English and Scottish ballads that form the basis of American folk music. At one point, Ronny says, he knew 200 songs in 20 languages — none of which he spoke. He also delivered entire shows featuring only songs by Texas-born Mickey Newbury, one of Nashville’s most beloved tunesmiths. In fact, Ronny didn’t write a song of his own until he was 50 — after he got his first record deal. It wasn’t that he was a late bloomer; he’d just been busy serving as one of Hollywood’s top character actors, and even co-writing (with Mary) and filming a screenplay, 1984’s Raw Courage. Ronny’s acting career began at Washington, D.C.’s Arena Stage, where he worked as a production intern while Mary, whom he’d wed when both were undergraduates, earned her doctorate in chemistry from Georgetown University. Their first son was born just before her 20th birthday; their second came while she was in grad school (she still managed to top her class, as always). While she did her post-doctoral residency at Manhattan’s Memorial Sloan-Kettering Cancer Center, he made his Broadway debut. Deliverance led to Apple’s Way, and a move to Los Angeles. Mary took a year off to care for the boys, which also provided respite from the sexism she encountered professionally. Sloan-Kettering had paid her male post-doc colleagues $500 extra per dependent, but refused her request for equal pay; when she asked UCLA if they might put her skills to use, they offered her a job washing test tubes. She decided to stay home. Meanwhile, Ronny gained fame for playing “men of authority: bad guys and presidents and head of the FBI, and all those Robocop and Total Recall characters.” Almost half include some sort of rank before their names. But he cites one in particular for inspiring his mid-career return to music: Los Angeles Police Chief Roger Kendrick, of the ill-fated 1990 TV series Cop Rock. Developed by Hill Street Blues creator Steven Bochco, the combination police procedural and ensemble musical also featured music by Randy Newman. He headed to Nashville, where he managed to get signed by Mercury Records on the strength of his performing skills. But he wasn’t a country artist and hadn’t yet found the folk community, so he didn’t quite fit in. Despite earning praise, his self-titled debut album went nowhere. The perception of another actor trying his hand at music didn’t help. “For the longest time, I had to live down being an actor,” Ronny remembers. That’s partly why, when the label paired him with hired-gun songwriters, he insisted on having major input instead of letting them do the creative heavy lifting. “Those guys taught me how to write a song,” he says. But to his surprise, Nashville’s tunesmiths were also eager to write with him. He finally figured out it was because his cinematic experience made him think visually, like a painter, which made for exceptionally vivid imagery — and great lyrics. As any real songwriter knows, a great lyric is one a listener relates to, whether it’s soul-baring truth or tall tale. And when Ronny stands on a stage and sings to an audience, he’s able to make an even stronger connection. Maybe it’s his actor’s timing. Maybe it’s his honesty — or his ability to convincingly tell “a lie that makes us realize truth.” He just knows it works. “I never feel more alive and vital than when I’m onstage in front of an audience,” he reveals. You can hear that pleasure on his 10 albums, some with amusing titles like Songs … with Repercussions and Acoustic Eclectricity (he’s also done a DVD, Songs, Stories … and Out & Out Lies, and an audio autobiography, Dueling Banjos: the Deliverance of Drew). For 2017’s Lost in the Words, Lost in the Music, he recorded both songs and stories before a live audience. These days, he turns down most acting offers so he can spend more time onstage, at events such as the annual Folk Alliance International Festival and Conference, held each February, or July’s Woodyfest, in Woody Guthrie’s hometown of Okemah, Oklahoma, or January’s 30A Songwriters Festival, which stretches along the coastal road of Florida’s panhandle. 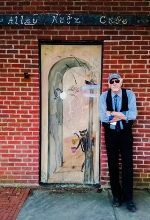 In 2018, his efforts earned him an inaugural-year Roundglass Music Award, given to artists creating “socially responsible music for wellness, environmental consciousness and peace.” He won in the Best American Roots Song category for “Bus to Baltimore,” about Alzheimer’s disease. Among his fellow winners was Ringo Starr. But Ronny is hardly ready to rest on his laurels. He’s still looking forward, planning for the next recording, the next tour, while occasionally convincing strangers he’s not their uncle — or, as one woman insisted, her gynecologist. “I almost never get recognized as an actor, but people think they know me,” Ronny says with a laugh. Once they listen to his stories, they will.